Research presentations and the discussion that took place at this international symposium were consolidated into a report that was published on December 17, 2014. This proceedings is being sold by Heibonsha and is available at book stores. For details, please check out the following webpage. IMAIZUMI Yoshihiko (1931–2010) is an individual who supported post-war avant garde art both implicitly and explicitly. Seeking to become a painter, IMAIZUMI began by writing critical essays for publications like the magazine Work & Critique in the 1950s. In 1958, he participated in the inaugural issue of the magazine Keishō (Form) (later renamed Kikan, or Organ). Through Keishō, IMAIZUMI interacted more with young avant garde artists at the time. The artists he met became lecturers at the art school known as Bigakkō (Art School) that the publisher Gendaishicho started in 1969. IMAIZUMI was involved with Bigakkō from its inception. In 1975, Bigakkō broke from Gendaishicho, and IMAIZUMI joined the School’s board to help run the School. Materials in IMAIZUMI’s collection that were related to Bigakkō were exhibited at an exhibit entitled “Anti-Academy” at the John Hansard Gallery at the University of Southampton in 2013. 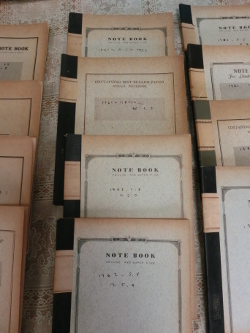 During the current survey, KIKKAWA Hideki and KAWAI Daisuke, Associate Fellows in the Department of Art Research, Archives, and Information Systems, examined materials consisting of a diary, photographs, books, magazines, and correspondence. This survey took place with the help of IMAIZUMI’s wife Eiko, who was referred to the Institute by SHIMADA Yoshiko, one of the individuals who planned the “Anti-Academy” exhibition. 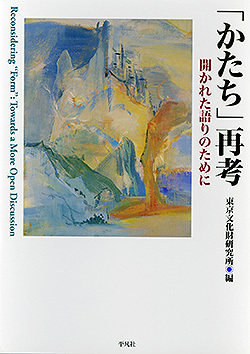 The materials were found to include a relatively large amount of correspondence with and documents regarding artists who later taught at Bigakkō such as NAKAMURA Hiroshi, a fellow graduate of the Art Department of Nihon University known for his reportage painting, AKASEGAWA Genpei, who met IMAIZUMI at a round-table discussion on “Keishō” and who went on trial for the “1000 Yen Note” incident (IMAIZUMI was one of the key figures who helped to support AKASEGAWA during his trial), KIKUHATA Mokuma, a key member of the avant-garde art group known as the Kyūshū-ha, and MATSUZAWA Yutaka, the pioneer of conceptual art in Japan. In addition to materials related to these artists, IMAIZUMI’s collection also includes a detailed diary he wrote from around 1960–1962. IMAIZUMI’s collection includes valuable records from the time when Japanese avant-garde art was at its peak. Plans are to continue studying post-war art by examining these materials in detail. The JAL Project (Head of the Executive Committee: KAMOGAWA Sachio, the Director of the Museum of Modern Art, Tokyo) seeks to invite specialists dealing with Japanese artworks overseas (such as librarians and archivists) to visit Japan. The Project also seeks to foster a network of specialists in Japanese artworks. In addition, the Project seeks to reconsider the way in which information on and documentation of Japanese art is provided based on feedback from specialists who have visited Japan as part of the Project. The Project started this year. TANAKA Atsushi, Assistant Director General of the Institute, and KIKKAWA Hideki, an Associate Fellow of the Institute, were tapped to join the Executive Committee of the JAL Project. Mr. KIKKAWA has met with potential invitees in their home countries, he provides them with training guidance, and he accompanies them during their tours of institutions in Japan. Ann ADACHI-TASCH is one of the invitees the JAL Project. Ms. ADACHI-TASCH served as the program coordinator for the C-MAP global research initiative of the Museum of Modern Art (MoMA) in New York. MIZUTANI Takeshi (a member of the Project’s Executive Committee and a librarian at the Museum of Modern Art, Tokyo) and Mr. KIKKAWA toured MoMA QNS and the EAT with Ms. ADACHI-TASCH on November 12. 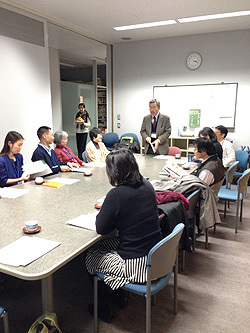 Seven specialists were invited to visit Japan, and these visitors received training at institutions in Tokyo, Kyoto, and Nara starting on December 1. 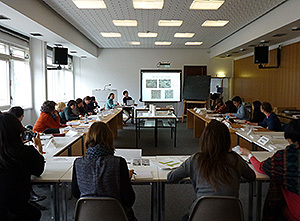 On December 3, the specialists visited the Institute, where they were given an overview of the Institute and its project to create an archive of cultural properties. The specialists examined library materials, photographs of studied artworks, and artist files . And then They exchanged information with researchers from the Institute. The specialists offered suggestions such as enhanced content in Romanized Japanese to facilitate dissemination of information overseas and allowing open access to photographs from studies. 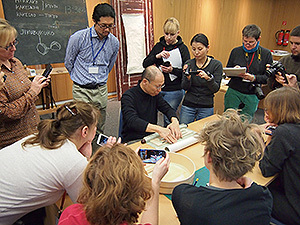 On the final day of training (December 11), an open workshop was held in the lecture hall of the Museum of Modern Art, Tokyo. This workshop provided a good opportunity to gain a fresh sense of what information on cultural properties is desired in the US and Europe. 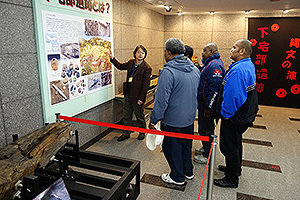 The 9th Conference on the Study of Intangible Folk Cultural Properties was held on December 5. 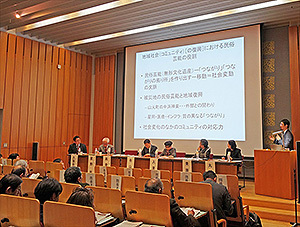 The topic of the conference was “Local Identity and Folk Performing Arts: Relocation/Resettlement and Intangible Cultural Heritage.” The Great East Japan Earthquake re-emphasized the fact that intangible cultural heritage such as folk performing arts is a way for a place to maintain its local identity. What role could folk performing arts play when communities are forced to relocate to higher ground or settle elsewhere because of an earthquake? To answer this question, this conference featured detailed presentations citing 4 examples of relocation or resettlement from around the country. The first example concerned the role and current status of folk performing arts that settlers brought with them when they settled Hokkaido. The second example concerned the state of “hometown associations” that natives of different islands and regions of Okinawa organized in Tokyo and the role that folk performing arts serve for these associations. The third example concerned the characteristics of believers in Pure Land Buddhism who migrated from Hokuriku to Fukushima Prefecture during the Edo period. The last example concerned folk performing arts that were discontinued as a result of depopulation in Yamanashi Prefecture; in fact, these arts are being practiced again by migrants to urban areas. The presentations were followed by a general discussion that delved deeper into the topic of folk performing arts based on the examples provided. Plans are to publish a report on the conference in March 2015. This year, a project on safeguarding the cultural heritage of the Oceania island countries was implemented as part of the Networking Core Centers for International Cooperation in the Conservation of Cultural Heritage Project. 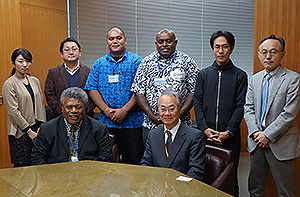 Fiji is a key country collaborating with the project, and 3 researchers from the Pacific Centre for Environment and Sustainable Development of the University of the South Pacific were invited to visit Japan. Joeli VEITAYAKI, Semi MASILOMANI, and John Kaitu’u from the Pacific Centre for Environment and Sustainable Development visited Japan on December 15 and concluded a memorandum of understanding (MOU) on scholarly exchanges and exchanges with the Institute. Until their departure on December 21, the researchers participated in various field studies and scholarly exchanges. On December 16, a Workshop on the Cultural Heritage of the South Pacific was held at the Institute, and opinions regarding cultural heritage were discussed in relation to sustainable development in the South Pacific and Japan. On December 17, a field study of the landscape and cultural heritage of satoyama woodlands was conducted near the City of Higashimurayama, Tokyo. On December 18, a survey on the use of cultural heritage was conducted in Chiba Prefecture’s Boso-no-Mura Museum. From December 19–21, the researchers visited Okinawa where they toured the Oceanic Culture Museum and learned about the cultural landscape in Bise (the Town of Motobu, Kunigami District). One of the visitors remarked that “Japan is a model of development in the Pacific region in the sense that it retained its culture as it developed.” Additional scholarly exchanges with the university are anticipated in the future. A final mission was sent to Bhutan from December 20 to 24 to conclude the Networking Core Centers Project for the Conservation of Traditional Buildings in the Kingdom of Bhutan. This project started in 2012 commissioned by the Agency for Cultural Affairs, Japan. A workshop was jointly organized with the Department of Culture, Ministry of Home and Cultural Affairs of the Kingdom of Bhutan to sum up the project. The project sought to determine how to properly conserve traditional rammed earth buildings such as houses and to improve their ability to withstand earthquakes. Results of the studies of construction technique and structure of the buildings over the last 3 years were presented by both Bhutanese and Japanese members. The personnel involved also discussed prospects for future works that the Bhutanese side need to undertake. The workshop was co-chaired by the Director of the Department of Culture (the direct counterpart in this project) and the Director General of the Institute. The workshop was attended by relevant personnel from the Division for Conservation of Heritage Sites of the Department of Culture as well as personnel from the Department of Disaster Management of the Ministry of Home and Cultural Affairs, the Department of Engineering Services of the Ministry of Works and Human Settlement, the Bhutan Standards Bureau, and the National Library of Bhutan. The architectural study team conducted field surveys of about 60 houses and temples as well as ruins, abandoned villages, and new rammed earth building sites. Information on traditional construction techniques (including techniques to reinforce structures) was compiled based on the findings of those surveys and interviews with craftsmen. Standardized format for investigation and tentative building typology were reported during the workshop. The structural study team conducted materials tests, micro-tremors measurement and destructive load tests to overcome structural vulnerabilities stemming from earthquake damage. Based on the results, basic techniques for assessment of structural strength and simulations of structural analysis were presented. In addition, a medium to long-term road map was proposed to see what steps could be taken to continue those surveys in the future and also if those surveys would lead to the formulation of guidelines to determine structural stability. In the meantime, existing buildings are being lost. Methods of preserving those buildings were also discussed. These joint surveys over the past 3 years are merely the prelude to understanding traditional construction techniques in Bhutan, and Bhutan has a long way to go in assessing the historical value of those structures and establishing techniques to properly preserving them. Bhutan is faced with the loss of its tangible and intangible cultural heritage due to natural disasters such as earthquakes and torrential rains as well as a mounting wave of urbanization. 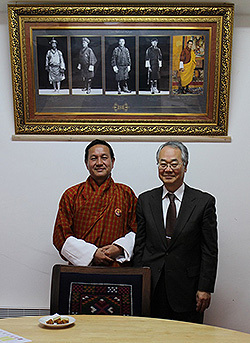 We hope Japan is able to assist Bhutan in safeguarding its cultural heritage, and to continue assisting the people of Bhutan in the future as well.